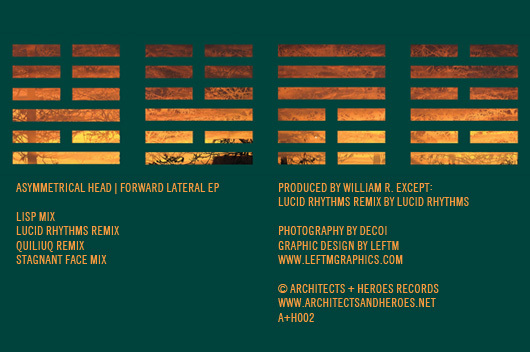 LOS ANGELES, CA – March 8, 2011 – Southern California resident Will Rosario’s Asymmetrical Head’s Forward Lateral EP is the third release on the newly minted Architects + Heroes imprint based in Los Angeles, CA. This release is designed to be a companion to the forthcoming The Treehouse Symposium full-length due late March. The tracks, four distinct iterations of a single musical concept, are divided evenly between the contemplative and the corporeal, and display the artistic leanings of close colleagues and Rosario’s alter-ego Quiliuq (pronounced Quill-Lick). Lucid Rhythms (AKA Jonathan Ace) also provides an upbeat remix. The EP is available on the Architects + Heroes Records bandcamp site. You can Donate or Download for free since this will be set at Name Your Price. Included in the download is artwork for each track, credits, and a press sheet.